India has successfully conducted a fourth test launch of its nuclear-capable intercontinental ballistic missile. 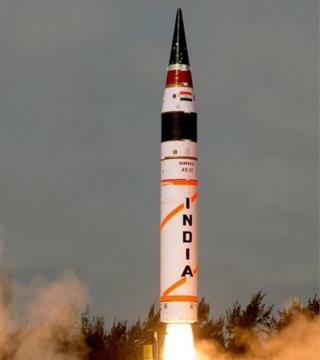 The Agni-V missile was launched from a site off the east coast on Monday. It has a range of more than 5,000km (3,100 miles), potentially bringing targets in China within striking distance. President Pranab Mukherjee tweeted that the launch "will enhance our strategic and deterrence capabilities". India conducted the first test launch of the Agni V in 2012, the second in 2013 and the third one in 2015, PTI news agency reported. The Agni-V is 17.5m (57ft) tall and solid-fuelled. It has three stages and a launch weight of 50 tonnes. The missiles are among India's most sophisticated weapons. Agni means "fire" in Hindi and Sanskrit.